Edmonton has participated in the annual We Love Cities award since 2014. For a second time in 3 years, World Wildlife Fund (WWF) declared Edmonton the winner of Canada's Earth Hour City Challenge, a year-long competition among cities to promote renewable energy and prepare for climate change. Congratulations to Bogor, Indonesia for winning the We Love Cities Challenge, becoming the most lovable city in the world. Thanks everyone for your votes, shares and suggestions! 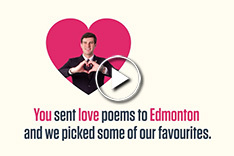 You sent love poems to Edmonton and we picked some of our favourites. During the We Love Cities campaign, you were asked for ideas to make Edmonton even better. Here are summaries of your comments and our responses.